Blog / Siena / 3 Great Reasons to Visit Poggio a Caiano Now! If you’re in Florence or Tuscany from now until October, I suggest you plan to include a visit to the Medici Villa at Poggio a Caiano, just 30 minutes from Florence. The very first reason why you should visit the villa is just because it is a Medici villa, one of 12 other villas (and 2 gardens) in Tuscany that were declared a UNESCO World Heritage site in 2013. Poggio a Caiano is from the late 15th-early 16th century, built for Lorenzo de’ Medici. 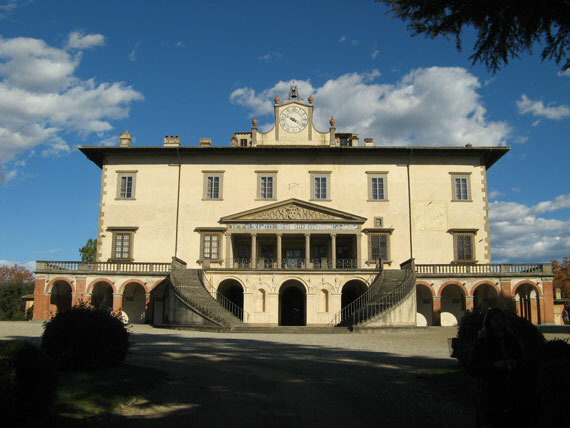 Through the centuries, the villa has been built upon and modernized to be used by the ducal court and royalty, up until the King of Italy when Florence was capital of the new nation. You will find the extraordinary ballroom with frescoes by Andrea del Sarto, Franciabigio and Alessandro Allori awe-inspiring, and see the rooms used by King Vittorio Emanuele II, and the private rooms that Elisa, Napoleon’s sister, loved while using the villa as a summer residence, among other treasures. You can read more about the villa’s history and what you can see inside on our article here. The second reason is that Poggio a Caiano is hosting a special temporary exhibit within the EXPO 2015 program and to its theme connected to food, and in this case, to the kitchen. The special exhibit “In Ancient Kitchens: Historical Kitchens and Painted Kitchens” will thus only run while the EXPO is running, and end on October 25th, 2015. The exhibit has been divided into four sections: the kitchens, the cooks, the pantries and the “secret” kitchens of the Grand Duke Cosimo II. The first 3 sections are hosted on the villa’s second floor in the rooms of the Museum of Still Life and include paintings and kitchen tools and utensils used in the past in the kitchen. I found the exhibit quite fascinating, as it includes molds for pudding made out of ceramic, some of the first books for cooks that illustrated how kitchens were to be set up and managed, the tools that were required, and paintings of tools that quite frankly have not changed much at all through the centuries (I’m thinking of the grater, in particular). There are paintings that show kitchens, think that these are some of the first representations of such a mundane subject. At first, they were still somehow religious, as is evident with the one by this one by the workshop of Francesco Bassano (dated 1576-1577, from the Palatine Gallery, Palazzo Pitti, Florence) where Christ is visiting Martha, Maria and Lazarus in their kitchen. Then there are paintings that represent the people within the kitchens, the cooks and those helping prepare the meals. Then there are still-lifes of many types of foods, which represented the various ingredients and supplies stored in the kitchen’s pantries. While some of the most famous paintings here are by Jacopo Chimenti, called the Empoli, I’ve chosen to highlight some other works in the exhibit to attract you to go explore the rest. The fourth section is my third reason to visit the villa soon, as the special restoration and opening of the “secret” kitchens of the villa will only coincide with this exhibit. The kitchens are in a large building separate from the villa but connected to it by a long and wide underground tunnel and are truly spectacular. The kitchens were not really a secret, as everyone knew they existed – but they were secret because there were 2 separate kitchens, one used for the general court and then the second was used solely to prepare the food for the Grand Duke and his close family. That these separate kitchens are ENORMOUS is quite fascinating, with a huge fireplace, large oven and several meter long ranges with individual fire pits underneath, to cook each pot separately and with support of a grill. I was really impressed – these are modern cooking ranges from the 16th century that are very well thought out to funnel smoke out of the kitchen and their distance also assures themselves there won’t be accidental fires that spread. There are even original wooden tables that can be closed upon the wall when they were not needed or in use (ha! IKEA did not invent nothing new!). Up until 1619, there were several kitchens within the villa on separate floors. Cosimo II and his wide Maria Magdalene of Austria entertained a lot of guests and wished to make the villa more spacious and hospitable, so the kitchens were moved out to the side. The secret kitchens were connected to the “common” kitchens by an open courtyard where the space permitted activities such as butchering, maintenance of tools and preparation of conservation). The common kitchens have been lost (in time, converted to apartments) and thus no longer maintain their original look or function. This has often happened and for this reason, the restoration of these spaces is quite unique as it really gives us the chance to step back in time and have a glimpse into a very normal, common every day activity must have been like in these spaces. It is a real pity that the secret kitchens will not become part of the areas that are normally open to the public that visits the villa. This is why going to visit Poggio a Caiano from now until October 25th is truly a one-of-a-kind occasion. A very final incentive to include the villa in your itinerary: the visit to the villa, to the exhibit and to the kitchens if completely FREE! The Villa is CLOSED on the 2nd and 3rd MONDAY of every month.